by Pavel Yakovlev – photo by Joey Hill – Saturday night, Fres Oquendo reminded the world that he is more than just a skilled technician: he can also bang. Oquendo made his point by stopping Robert Hawkins in seven rounds, dominating the action with crackling right hands and a hurtful body attack. The early finish surprised many, as Hawkins is known for his durability. Oquendo’s speed, punching precision, and power, however, overwhelmed Hawkins and rendered a knockout unavoidable. After battering Hawkins with jabs and well-placed body punches in the first two rounds, Oquendo shifted his attack to the head. Hawkins was knocked down twice in the third, and absorbed punishment for several more rounds before retiring at the end of the seventh. Repeatedly, the sturdy and thickset Hawkins was rocked by Oquendo’s grenade-like rights. Oquendo is now 35-7, including 23 wins by knockout. Presently ranked 14th worldwide by the WBA, He is now seeking an elimination bout against a top contender. A native of Puerto Rico who grew up in Chicago, Oquendo holds the WBA Fedlatin title. Hawkins has been stopped only four times in his 18 year pro career, which has spanned 43 fights. His reputation as a boxer who is difficult to knockout is well earned. 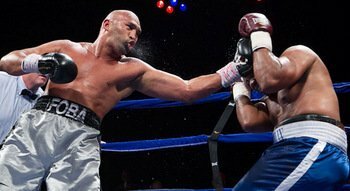 Previously, Hawkins had lost decisions against hard punchers such as David Tua, Sam Peter, Oleg Maskaev, Bermane Stiverne, and Denis Boytsov. A native of Philadelphia, Hawkins’s record is 23-20, with seven knockouts. The Oquendo-Hawkins bout was staged at the Horseshoe Casino in Hammond, Indiana. The card was promoted by Hitz Boxing. Oquendo weighed 220 lbs against 245 lbs for Hawkins.